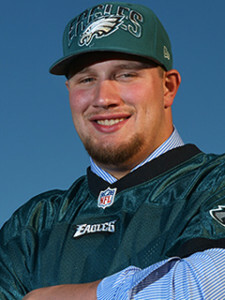 The Philadelphia Eagles announce they have agreed to terms with tackle Lane Johnson on a four-year contract. Eagles, Johnson agree to terms. Johnson (6-foot-6, 310 pounds) was the Eagles’ first-round pick and fourth overall selection in the 2013 NFL Draft. The 23-year-old played collegiately as a quarterback, tight end and defensive lineman before transitioning to the offensive line as a junior in 2011. After transferring from Kilgore College in 2009, Johnson went on to appear in 32 career games at Oklahoma, starting 25 total contests (13 at left tackle, 12 at right tackle). He garnered second-team All-Big 12 honors as a senior after anchoring a Sooner offense that ranked 12th in the nation with 497.9 yards per game. A native of Groveton, Texas, Johnson earned all-district, all-region and all-state honors as a quarterback at Groveton High School. He also lettered in track and field, placing fourth in the shot put at the state’s track championship.